Nexonia Expenses is a best-in-class platform that supports expense tracking, time tracking, payroll preparation, and purchase order management. This platform has a robust set of useful features that aid executives, administrators, and employees to stay in control over business spending. 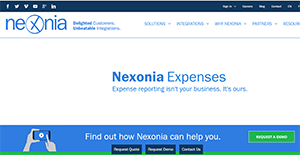 Nexonia Expenses helps businesses to develop streamlined workflows for expense tracking, submission, and approval. Also, this cloud-based solution is simple and configurable making it a dominant force in the time and expenses management space. Also, the platform brings convenience to your business by combining ERP (Enterprise Resource Planning) systems and credit card reconciliation, accounting system integrations, and multi-currency support. Moreover, Nexonia Expenses has an intuitive and easy to use mobile app which helps you to monitor expenses from anywhere. Nexonia Expense is a reliable program that provides simple ways of organizing all your expenses. It’s a great accountability platform designed to streamline all processes of creating, submitting, and approving expenses. A notable feature is certainly the the flexible approval workflow. As an administrator or business executive Nexonia Expense gives you the freedom to easily establish procedures to submitting expenses. It helps you to determine the most crucial parameters and provide your employees with simple ways of handling expenses. The program makes it easy to customize the approval process to meet the special need of your business. Also, the streamlined process automatically routes all submitted expenses to department/individual in charge of the approval. Nexonia Expenses has a powerful mobile application. This App gives you the freedom to create, manage, and approve expense reports from anywhere. The intuitive and easy-to-use mobile app is compatible with multiple devices including iOS, BlackBerry, Android, and Windows Phone. With the Nexonia Expense mobile app, you employee can work on the reports on offline mode and submit them later. Additionally, there is a synchronization option the helps you to submit reports manually or automatically. This software also offers credit card and multi-currency support. The Nexonia Expense interface gives you the freedom to choose from up to 160 currencies. The exchange rates are automatically updated by the program to ensure each amount is calculated accurately. This provides a comprehensive expense tracking for your business and affirms Nexonia Expenses usefulness in supporting global businesses. Each business is different, and can call for a particular type of Accounting Software solution that will be designed for their company size, type of clients and employees and even specific niche they deal with. You should not count on locating a perfect app that will work for every business no matter what their background is. It may be a good idea to read a few Nexonia Expenses reviews first and even then you should remember what the service is supposed to do for your company and your employees. Do you need a simple and straightforward solution with just basic functions? Will you really use the advanced functionalities required by experts and big enterprises? Are there any specific tools that are especially beneficial for the industry you operate in? If you ask yourself these questions it will be much easier to get a reliable solution that will match your budget. How Much Does Nexonia Expenses Cost? Nexonia’s SMB and enterprise pricing information is available only upon request. Contact the company for more details, and ask for your quote. We realize that when you make a decision to buy Expenses Management Software it’s important not only to see how experts evaluate it in their reviews, but also to find out if the real people and companies that buy it are actually satisfied with the product. That’s why we’ve created our behavior-based Customer Satisfaction Algorithm™ that gathers customer reviews, comments and Nexonia Expenses reviews across a wide range of social media sites. The data is then presented in an easy to digest form showing how many people had positive and negative experience with Nexonia Expenses. With that information at hand you should be equipped to make an informed buying decision that you won’t regret. The implementation team has been awesome! A robust product with quality service. Staff is thrilled with its features and usability. It's a whole lot better than taking the old approach. What are Nexonia Expenses pricing details? What integrations are available for Nexonia Expenses? Pros: As great as Nexonia can be, what I like most with it is their staff. They're constantly making it a point in showcasing how thrilled they are in helping you out. Furthermore, they're constantly making system upgrades. So it won't take long to have a certain functionality to be included within the system. They also do a great job listening to whatever it is that you have to say. Cons: If I had to choose something that I didn't favor, I'd say the gaps seen in its features. Thankfully, they're only a temporary thing. Nexonia continues to update their system quickly. Aside from that, there's nothing else to hate. Pros: In a nutshell, being able to collaborate with the team from Nexonia appears to be the smoothest in terms of integration with Netsuite. Issues were resolved swiftly. Communication has never been clearer.It's highly intuitive. Functions as what you'd expect. Cons: Came with zero 2FA support. However, the development team is responsive. They're in the middle of working on this problem. Comes with Netflix configuration and top notch support! UI is simple, great work with, and comes with a functional mobile app! A fantastic solution for any business.